Lunch at a Korean Restaurant, San Jose, Costa Rica, a photo by crclapiz on Flickr. 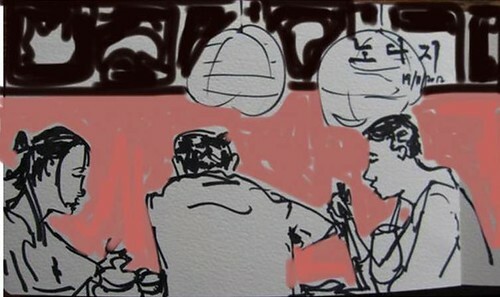 After lunch, yesterday, I had a few minutes to sketch these men, who were obviously enjoying their noodles and meat from the grill. Color added later on the ipad.